Tournament organisers expect tickets for the three Rugby League World Cup 2017 games in Papua New Guinea to be snapped up quickly when they go on general sale at 10.00am (local), this Thursday 24 August 2017. Due to this high demand, RLWC2017 CEO Andrew Hill is urging fans to purchase their tickets when they go on general sale to avoid disappointment. 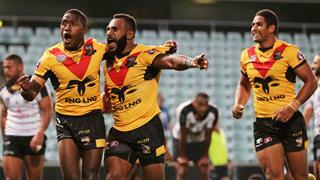 “This year’s tournament is the most anticipated sporting event Papua New Guinea has ever hosted and we know there is huge demand for tickets from fans wanting to be part of history. With a capped crowd capacity of 15,000 for each game, we expect tickets to sell quickly when they go on general sale,” said Hill. The RLWC2017 will be contested from 27 October to 2 December and features 14 nations playing 28 matches in 13 cities across Australia, New Zealand and in PNG.